I know many of the folks here have been making variations of this. Where'd you get the clip? I race with a guy who made a similar thing but he attached some rope the the clip, then a large (1.5" diameter) ball to the top of the rope. He sewed a button hole (sort of) on the side of his pants (just above where your vent would be) and the ball/rope/clip assembly threads through there and then he clips that into his intec handle. He doesn't need to bend at all to unclip. I'm a little skeptical for folks like you who lay it all the way down in carves. Isn't there a chance of snagging the handle in a carve and releasing your heel? That would be ugly! Sorry, I forgot to note that each INTEC handle clicks in those snap-on's in the 1/2"- or 3/4"-size (whichever the smallest sold at REI). Thanks for reminding me. Thanks, yeah I knew what you meant. That's a cool set up. I was at K-wood yesterday for Doug Dryer school on how to carve Hiroshi-style. I need to get in some sneak sessions while you aren't around so I can try to get my skills up to par. I actually touched my hip to the snow a couple of times in the afternoon and I was dragging my chest/arms on toe-side. It feels good to round out my skill set. I tried carving under the lift-queue rope. I got under, but didn't succeed in getting back up either time. Oh, and on one toe-side carve I got so locked into the turn that I t-boned the bottom of Mike Doyle's board. Lots of laughs from the carvers on the hill near him. Of course now really no one wants to be in front of me. Before it was just a concern of me passing them at high speed, now I'm a menace to their p-tex. Naturally, one of my favorite parts of the day was before the lesson started. I brought my Burner 197. At about 9:30am I made about 5 turns on that run from Cornice before straightlining it from above the SLOW sign to the bottom. Talk about fast! Yeeha. It is great on a weekday when there are no people in the way. Plus my Alpine pass got me a $20 lift ticket. I start a new job on Monday so no more weekday riding for a while. You are always welcome to stay at my cabin if you want to ride Alpine with us one day. I checked at REI. It is a 3/4" buckle, not a 1/2" one. The old boring square style work fine. ... and it looks like this, sticking out of my pants' side vent. 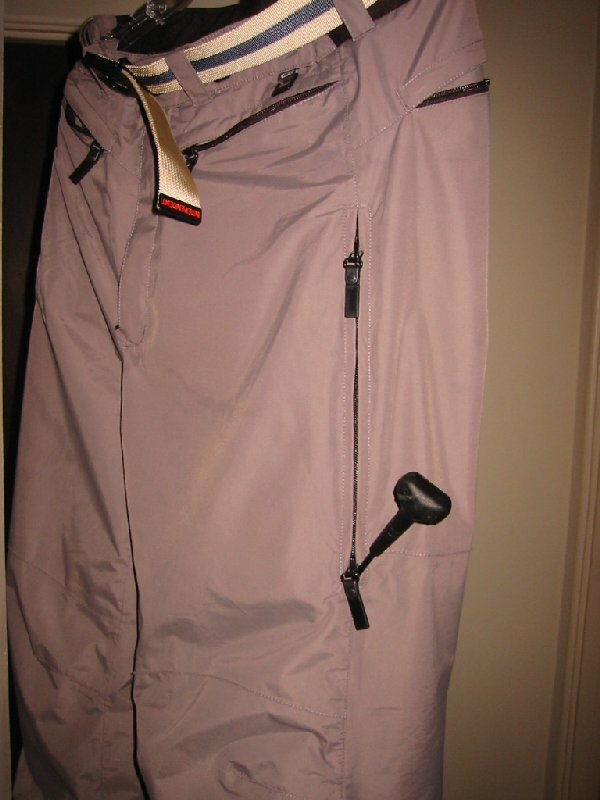 The pants' side vents have to be a wide-open kind, not the mesh-covered kind (or it has to be cut open a hole for this). With my short legs (& pants size & its vent location), the cable housing is about 11". Last night I cut it down from the initial 13" (which I had for a few weeks), because it was sticking out too long out of the pants vent, especially when my legs were bent (though it still worked quite well functionally). This new shorter length seems to be perfect for me - will check it out this weekend. 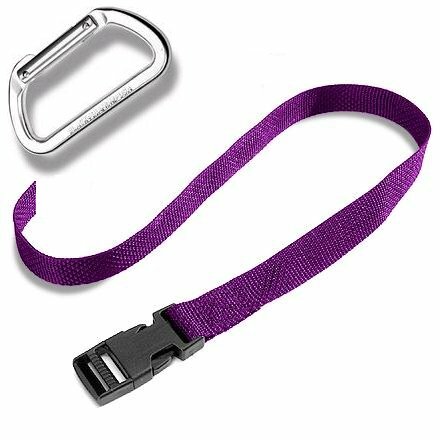 Previously I'd been happily using a simple "strap" version of this for a while, attaching a 'carabiner' as a "handle" at the end of a strap. (You can find a ton of these things at a local hiking/climbing store.) However, the thing with that version was that the 'handle' attached onto a soft/flexy strap dangled downward out of my pants vent, so I still had to slightly bend over to grab it. 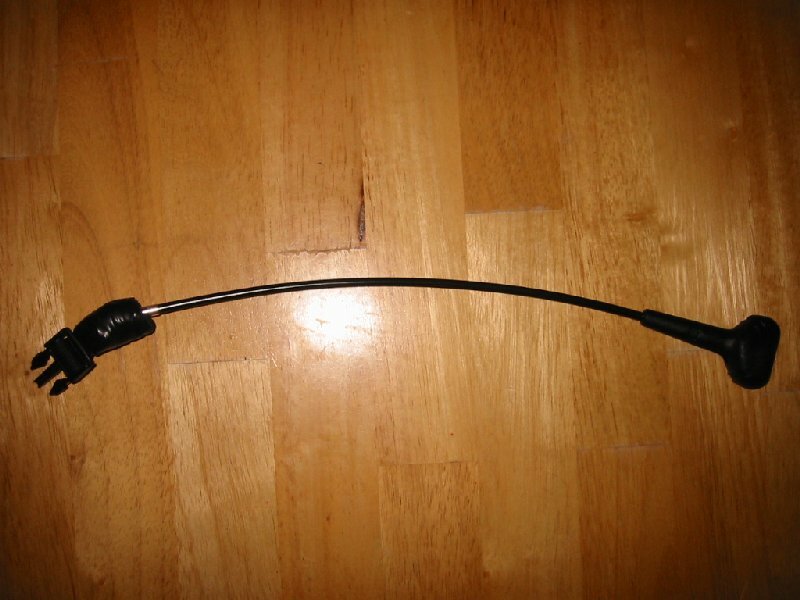 Now, with this cable version, the stiffer cable housing makes the INTEC handle stays nicely up-right out of the pants vent, making it easier to grab without having to bend over any. The most difficult part for me was attaching a mt-bike shifter cable (not a brake cable) & housing to this "snap-on" piece. In the fear of breaking the plastic "snap-on", I didn't want to attach the cable directly onto the piece. So, I ended up making a short loop with the strap ends, and put the cable thru it, tied many knots, super-glued all the knots, then wrapped an electric tape thickly around it. 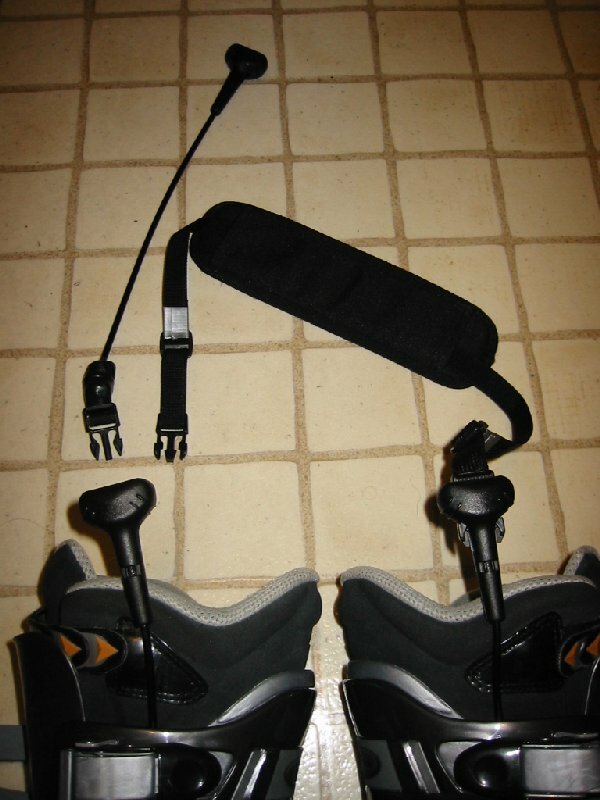 By the way, I personally chose this method over a one long mt-bike cable straight from the heel-piece up to the pants, because pulling the long cable through my pants up to the vent each time seemed like a labor, and having a long cable out of my boots seemed to get in a way of things when carried or stored. With this 'extension' option, I just leave the extension piece hanging in my pants at all times, and simply click it into the boot's INTEC handle piece when buckling up my boots in the morning. y'all west coast peoples just got too much time on your hands. here on the east coast would have used all that R&D time to drink beer. I also just carry a simple strap with "snap-on's" on its both ends. At the end of the day, I click them into my boots INTEC handles, and carry my boots over my shoulder. I can't show you mine. It would be too offensive if I showed where my cable comes out. I can only tell that I need to squeze my buttocks harder and it pops out... Then I am free to go. Ohh... I forgot that's not that cable. Sorry.